Put 2 tablespoons of oil, 3 tablespoons of soy sauce, and chicken in wok and cook until chicken is done then set aside in a large bowl. Cut up vegetables and fry in pan with oil and 2 T. soy sauce (bean sprouts last, they don't need to cook long at all) then add to chicken. Set mixture aside in a separate dish. Put rice and water in microwave for about 12-15 minutes until rice is tender. Put oil and rice in wok and fry for 5 minutes with the rest o the soy sauce. Beat eggs together and pour over the top cook for one minute and add chicken and vegetable mixture. 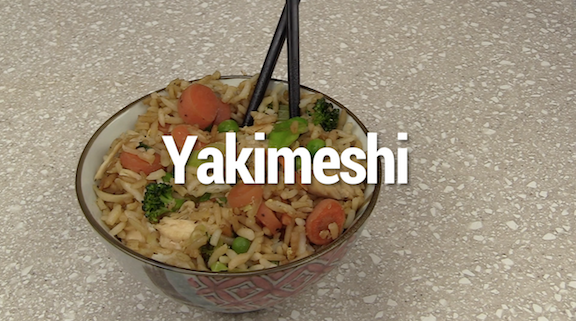 A delicious variation is to put the chicken in a crock pot all day with a bottle of teriyaki baste and glaze sauce.